If the current schedule holds, Virgin Galactic’s revamped LauncherOne program will enter commercial service sometime in 2018 after roughly a decade of development. During that period, the program has been redefined several times, lost two of the key people hired to lead it, and changed its launch platform from WhiteKnightTwo to a jumbo jet. The estimates for the initial flight tests also have slipped by about four years from 2013 to 2017. Below is a timeline of the program’s major events, milestones, announcements, hires and departures, and other things. Feel free to let me know if I’ve missed anything significant. MOJAVE, Calif., September 28, 2015 (Virgin Galactic PR) – Successful test firings of key propulsion components marked the latest sign of progress for Virgin Galactic’s dedicated small satellite launch vehicle, LauncherOne. Working on custom-built test stands at the company’s Mojave, California location, Virgin Galactic engineers and technicians achieved longer duration, steady-state firings of LauncherOne’s main stage engine in the same week as multiple full duration firings of the gas generator for LauncherOne’s upper stage engine. Virgin Galactic is developing a rocket more powerful than LauncherOne to fulfill a recent order for 39 launches from its global satellite Internet partner OneWeb, according to sources familiar with the program. LauncherTwo will use Virgin Galactic’s largest liquid fuel engine, NewtonThree, in its first stage, according to sources that insisted upon anonymity. 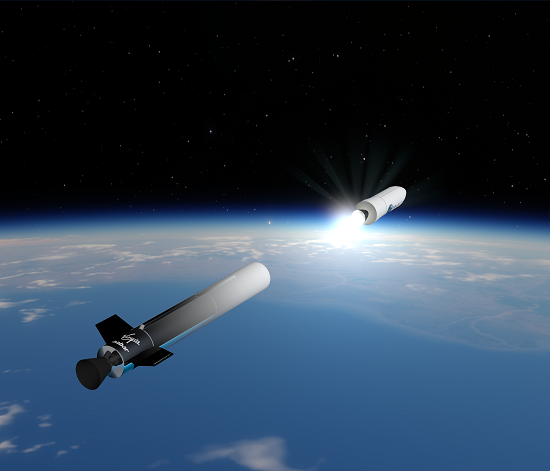 A new engine, NewtonFour, will be developed for the second stage. Is a Google-Virgin Galactic Deal in the Works? 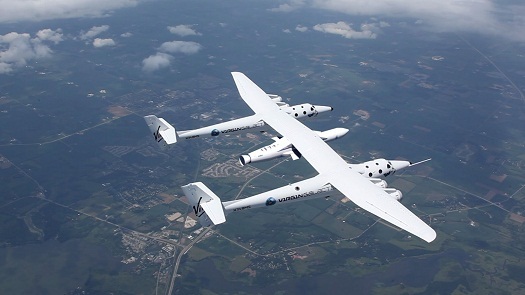 While Elon Musk’s lawsuit against the U.S. Air Force has dominated the headlines, another development with the potential to restructure the space industry has flown completely under the radar: a deepening relationship between Virgin Galactic and Google. Overt the past month, Virgin Galactic conducted a series of Google Hangouts about its space tourism program in conjunction with the Google Science Fair. 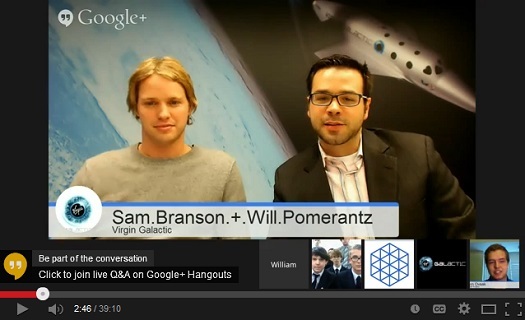 One hangout featured VG Vice President William Pomerantz and Richard Branson’s son, Sam; a second had three engineers live from The Spaceship Company’s FAITH hangar in Mojave, Calif; and a third featured two ticket holders who will be aboard future SpaceShipTwo suborbital tourism flights. MOJAVE, Calif. (VG PR) – Virgin Galactic, the world’s first commercial spaceline, announced today that it has reached a significant milestone in the testing of a new family of liquid rocket engines for LauncherOne, the company’s small satellite launch vehicle. As part of a rapid development program, Virgin Galactic has now hot-fired both a 3,500 lbf thrust rocket engine and a 47,500 lbf thrust rocket engine, called the “NewtonOne” and “NewtonTwo” respectively. Further, the NewtonOne engine has successfully completed a full-mission duty cycle on the test stand, firing for the five-minute duration expected of the upper stage engine on a typical flight to orbit. These tests are being conducted on two new state-of-the-art test stands that the team designed, assembled and installed internally.